So, I saw Rachael Ray make this gyro deluxe platter the other day and I just HAD to try it. I followed the recipe exactly except I added 1 clove of garlic to the chicken gravy for the fries. 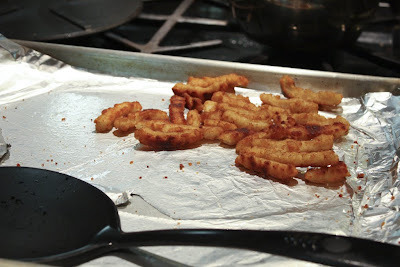 Place fries in oven on a baking sheet. Place lamb in a bowl. Add grill seasoning, 2 teaspoons cumin, chili powder, coriander, oregano, cinnamon and feta crumbles. Wring the spinach dry in a kitchen towel and add to lamb. Mix the lamb and form a long 3-inch roll on a baking sheet. Coat lamb with extra-virgin olive oil and bake 20 minutes. Place fries and lamb in oven and roast 20 minutes. Mix yogurt, a grated clove of garlic, cucumber, the juice of 1 lemon and 1/2 teaspoon cumin. Slice and reserve the tomatoes, cucumbers and drain hot peppers, chop and reserve. In a small sauce pot, melt butter over medium heat. Whisk in flour and cook 1 minute. Add Worcestershire sauce and whisk in stock. 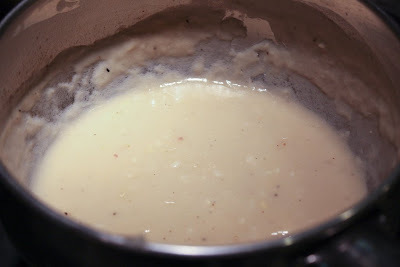 Season gravy with salt and pepper and reduce 5 minutes. Soften pita over open gas flame or under broiler. Slice lamb loaf into 1/4-inch slices. 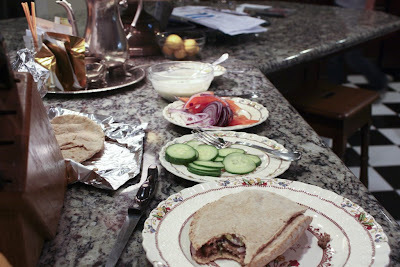 Spread yogurt on pitas and top with a 2 slices of lamb, tomatoes, cucumbers and hot peppers. Serve 2 pitas per person. Serve fries with gravy for dipping alongside. That much meat makes enough for 6 easily tho. There were 4 of us eating and we had one whole log leftover. When I watched the show, she cooked the meat in 2 smaller logs to make it cook faster so I did that as well, even though the recipe didn’t say to. They didn’t have any waffle fries at the store so I got Ore-Ida Crispers! This was really great and very easy to make. You can substitute ground beef if you can’t get lamb or choose not to eat lamb. I hope you try it! Posted by galadriel07 on March 5, 2009 in General Food, Meals! Well, I haven’t had a fridge for a few weeks now because our old one died. I ended up with food poisoning from it and haven’t been feeling up to doing much of anything since then. Tonight I decided to make some meatloaf and roasted potatoes with green beans. 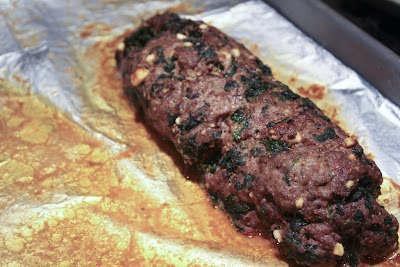 I made individual meat loaves this time and everything turned out really good. I basically used steakhouse seasoning for everything, plus some extra garlic and red pepper flakes. I took a packet of mushroom gravy mix and added some fresh sauteed mushrooms to it. It was really delicious and I tend to do that every time I make gravy now. Hopefully, we will be getting a fridge soon so we don’t have to go out every day. I will be cooking more then too. Posted by galadriel07 on October 16, 2008 in General Food, Meals!